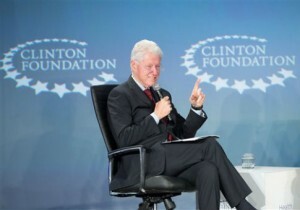 The Clinton Foundation’s Colombia-based investment company was not registered as a private equity fund in the country, which may have allowed it to avoid certain industry regulations and oversight from the Colombian government. Although Fondo Acceso described itself as a "Private Equity Fund" in company promotional materials and business presentations, it is not listed in a database maintained by the Colombian government of current or previously registered private equity funds. Colombian legal experts consulted by the Free Beacon said that Fondo Acceso did not appear to have violated any laws by calling itself a private equity fund, as long as it was not doing so while trying to raise capital. According to its corporate records, Fondo Acceso is registered in Colombia as a "simplified stock corporation," which legal experts said precludes it from doing business as a private equity fund. Fondo Acceso’s website was also removed from the internet this week, shortly after the Washington Free Beacon reported that the $20 million investment firm was owned by the Clinton Foundation and was run out of the foundation’s office in Bogota. The website had previously described Acceso as "a Private Equity Fund that seeks investment opportunities in small and medium Colombian compan[ies] with the purpose of obtaining economic and social returns." Its website also included a contract for companies seeking investment to fill out, which authorized the release of financial and other internal information to Fondo Acceso and the Clinton Foundation. The Fondo Acceso website was still inaccessible as of Sunday evening. The website had been registered to Monika Kellner, a Clinton Foundation official, and was created in 2010, according to online records. Fondo Acceso’s manager, Carolina Botero, who is also chief financial officer at the Clinton-Giustra Enterprise Partnership, called the firm a "Private Equity Fund" in a presentation to the Cartagena Chamber of Commerce in July 2012. The presentation appeared to be geared toward companies that were seeking funding, as opposed to potential investors, which legal experts said was permissible. Hernando Padilla, a partner at Philippi, Prietocarrizosa & Uría, a top Colombian law firm, said it would be unusual in Colombia for a company to identify itself as a private equity fund when it was actually a simplified stock corporation. He said a company might do this to avoid government regulations and oversight of the private equity industry. "They don’t want to be under the surveillance and regulation of the Superintendency of Finance," he said. "That’s the reason." A spokesperson for the Clinton Foundation directed inquiries about Fondo Acceso’s website and private equity status to the Clinton-Giustra Enterprise Partnership. The partnership did not respond to request for comment. Christy Louth, a Fondo Acceso director and an official at the Clinton-Giustra Enterprise Partnership, did not respond to requests for comment about whether Fondo Acceso attempted to register as a private equity fund. Fondo Acceso was founded in 2010 by Bill Clinton, the Mexican billionaire Carlos Slim, and the Canadian mining magnate Frank Giustra. The Clinton Foundation and the SLIM Foundation committed $10 million each to the fund. The Clinton Foundation is a 50 percent shareholder in the company, according to its tax records. Numerous Clinton Foundation and Clinton-Giustra Enterprise Partnership officials are listed as Fondo Acceso directors in Colombian corporate filings. The fund has reportedly distributed $1.5 million to Alimentos SAS, a fruit-pulping company, and $250,000 to the telecommunications firm Fontel SA in exchange for shareholding agreements. The Clinton Foundation and CGEP have declined to release a full list of Fondo Acceso’s investments.